RNS Journal … | Computers taking over our jobs and our pay? Home » Mail & Comment » Computers taking over our jobs and our pay? in three big ways, explaining the massive shift seen in the data. and my long comment It’s computers programmed to maximize growing investor profits that naturally causes those effects. 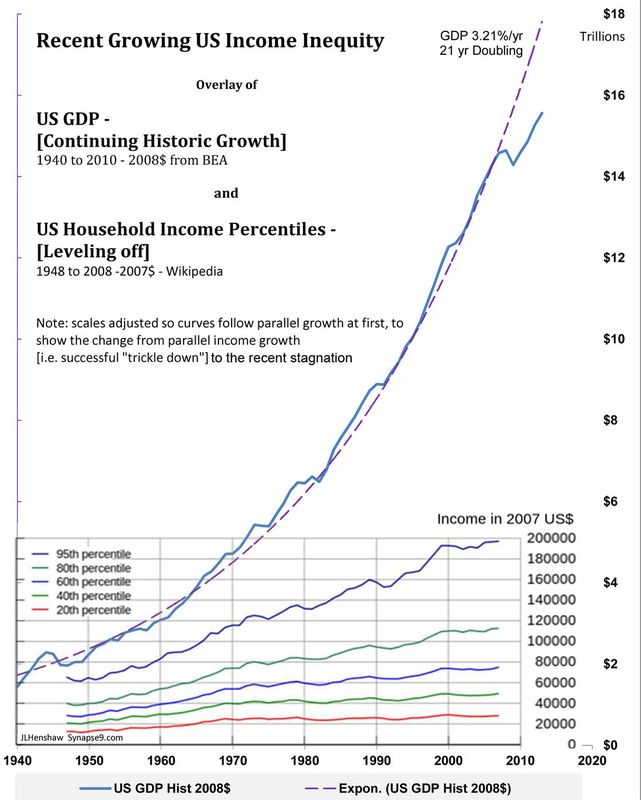 Preface: My last post on the dramatic declining share of wages in GDP since 1970 mostly discussed that remarkable change in behavior of the whole system in relation to how the numbing complexity of business would make computers better “wage earners”, shifting income from wage earners to investors. Complexity too great to follow what’s happening… ?? The graph here is a simpler version, showing the same dramatic shift in the disproportionate changes in wages and GDP since 1970. This post is on how the same shift from wages to profits reduces demand for the products, “made for people” but for which neither business decision making tools nor investors have an appetite. The economy visibly changed behavior. It was coincident with computer decision making emerging as a leading tool of business, and the historic numbing complexity everyone has experienced (reflected in changing language use). The third important way is a later realization. Computers are overwhelmingly better at making deterministic predictions… but can’t be programmed to consider human values, so they’re omitted from the rules for what to optimize… Computers are even more likely to keep applying old values that no longer apply than humans too. When resource prices go up, for example, the old standard investment models say “speed up”, while nature is signaling “slow down”. It may seem there’s nothing more dispassionate and “neutral” than automated decision making, but that easily becomes purely ruthless too. So it seems to create a “perfect storm” of misdirection to use computers to multiply their programs in a time of fundamental change in our world. If the model says “choice A = X profit” there’s no way to tell if a different story would be told had humans studied how ‘A’ applied in the current circumstance, so the model built without human values also omits any way to argue with it. You can see one global effect of this naturally “inhuman” decision making of computer models in their universal penny shaving for profit. That seems directly behind the ever stricter control of decisions, since computers were introduce, by the computer’s measure of value, “the bottom line”. Before that, business people needed to think of the business as a whole, and not a single number, ruling almost every choice. So it produces ever growing pressure to “make money” for the sake of money, whether making a bit less to invest in other values might be a better fiduciary choice. Author’s Note: 2/16 – My work on this problem dates back to the 70’s really, and my developing methods for “whole system accounting”. In simple terms “whole system” or “inclusive” accounting means you can’t keep “robbing Peter to pay Paul” without noticing. It comes from the customary methods of natural science, not used in economics. Instead of using arbitrary accounting categories, one uses naturally defined partitions of the whole system to define your categories. One is ultimately forced to get it right by there being lots of natural reasons you can’t keep “robbing Peter” (calling what’s unaccounted for ‘externalities’) without dire consequences. Whole system accounting models force you to look at what you are leaving out of the model, by requiring the use of accounting categories that add up to the whole, partitions of the system. That’s what natural science does to validate the data collection and produce “closed accounting” of the system in question. Oddly so do business financial accounts, but just not economic accounts. Using partitions of the whole for your accounting categories forces you to estimate how much is going uncounted. The first discussions of complete economic economic models of that kind are my 1983 General Allocation Theory and 1985 Unconditional Positive feedback in the economic system in the SGSR proceedings for that year. 1970 marked the sudden end of steadily growing US wages, as a sharply accelerating trend of growing economic inequity and loss or resilience began. computers emerged as the premiere tool for driving business profit. as things got too complex? 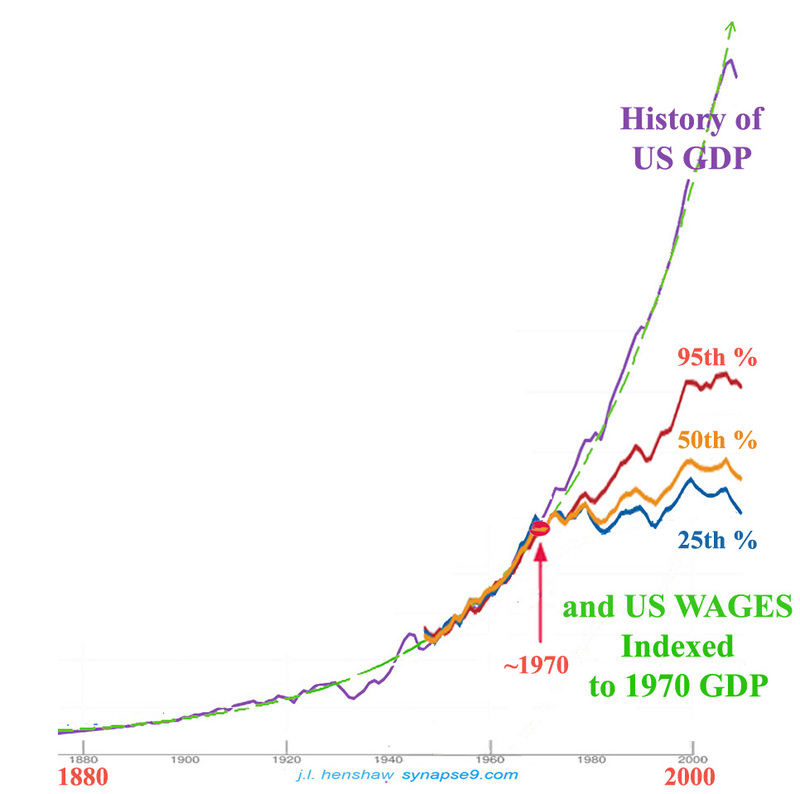 Indexing UN GDP (1880 to 2010) and US median wage levels (from 1948) at 1970 shows how they grew at the same rates before 1970, and then have been growing apart. It shows the divergence between levels of wage incomes and wealth, a societal shift from earned incomes and wages, toward unearned income and finance. It’s remarkably clear in the data, quite indelible as a “coincidence” between introducing computers for business use in ~1970 and the “the great divergence” of breaking American society apart with lagging earnings from employment and multiplying earnings from wealth. Why did it occur. Following from my 2010 Complexity too great to follow what’s happening… ? one could explain it as cause by the numbing increase in the complexity of everything we do, affecting people but not the computers or the calculation of profits. Looked at from a social view of ever faster increasing economic inequity… it looks more like people using computers to make money, robbing Peter to pay Paul and not counting it. Computers became the easy way to sidestep the cumbersome nuisance of people needing to think about what they were doing in order to keep multiplying their tasks. That “extension” of our bodies with a new tool had a range of different effects unlike any other ever before. That computers and their rules would later also run into EXACTLY the same problem, in our finding it not possible to update computers with new rules as fast as they were changing our world, is also very evident here. That’s a spot on match for what I predicted in 79, actually, as the ultimate certain limit of growth. The ultimate limit of growth is confusion, caused by the parts of the growing system needing to make ever more complex and complexly changing responses, ever faster. The 1st essay on the natural limits of growth due to its growing unmanageable complexity from 1979, The Infinite Society. A great deal of work since then was done on a general theory and method for understanding naturally occurring systems, discussed both elsewhere in this research notes Journal, RNS and also in my Open Systems Research Archive. As discussed in the prior post on the subject, compare that to how our the frequency of the word “complex” first grew in pace with the growing complexity of the economy, and then started to drop off when life and decision making became more unmanageable complex. Well, debate points aside, there’s more to the macro-economic change than mentioned here. There’s clearly a major technology take-over of production and information services, so the “agents” of the economy with the appetites for consuming said services are increasingly not being paid enough to consume them. So… if it’s technology that’s producing the wealth, and not labor, what do you do to keep the economy afloat?? Technology has no need for the products it creates. In a tech dominant world the earnings of the technology go to investors, as profits, not to the technology for consuming the services. As an a whole system “the circle won’t be closed” unless investors spend enough of their earnings hiring humans, so they can exercise their appetites in consuming the products. Investors… of course, live by the opposite principle, compound accumulation. I think this actually clarifies a heck of a lot, solving the riddle of humans appearing likely to go the way of the horse. That’s impossible, as technology has no desire for its own products. It also solves the riddle of Chapter 16 in The General Theory, where Keynes points to this same impasse, in another way. That to work as a system requires investors to be the spenders of last resort to relieve flagging demand, to hire people and not just multiply their money when needed. it’s the appetites that drive it, and technology doesn’t have any. More data and discussion of the structural problem and natural limits of technology take-over on Signals: Complexity too great to follow what’s happening…? ?